Why is the New EMS Billing Clerk Allowed to Have 2 County Jobs? Debria Murphy was hired to be the EMS billing clerk after she “audited” the 11-year EMS billing clerk and “found problems.” She is from Putnam County and has worked many years with Jasper’s new EMS Director, James Gregory. 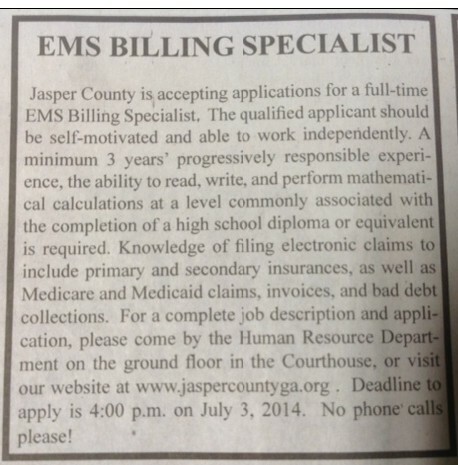 A couple of weeks ago an ad was in the paper for an EMS Billing Clerk. Strange, isn’t it? But maybe not. This could be the “cover” the county needs for never advertising for the position Ms. Murphy got, or it could be the “cover” they need for hiring the former (recently resigned) Coroner, Michelle Haddock, who is helping Ms. Murphy. Or the county might actually be hiring someone new; no one really knows because these things are secret until someone is hired. The former Coroner, Haddock, has been helping Debria Murphy review the insurance billing reports; sort of a quality control person. Ms. Haddock is said to be starting work on an ambulance for EMS as an EMT as well as helping with the billing work. Even more interesting is Debria Murphy now has two jobs with the county—in violation of the personnel policy. She is the EMS billing clerk (part of the financial staff), and she is working for EMS as an EMT. In fact sources tell us that she worked an EMS shift Monday night, then came to work on Tuesday to do billing and had to work until 6PM—getting overtime, no doubt. Debria’s partner on the ambulance is Roy Perry, another employee from Putnam County hired by James Gregory. Maybe Debria Murphy’s working two jobs in two different capacities for the county is why she needs extra help with her billing job. But as long as she works for the same employer at two different jobs overtime comes into play, and that is a big no-no now. Well, it’s a no-no for most employees, but it may not be for someone our County Manager/Finance Director, Karen Degges, hired as a member of her team. $50,000 of overtime for EMS was taken out of the FY15 budget. If you didn’t read our blog as to how the current EMS billing clerk got her job, click here. Only by being informed can the citizens understand what is being done and make good decisions. That is our goal with the Taxdogs blog. This entry was posted in Budgets, County, EMS and tagged Debria Murphy, James Gregory, Jasper County EMS, Karen Degges, Michelle Haddock. Bookmark the permalink.